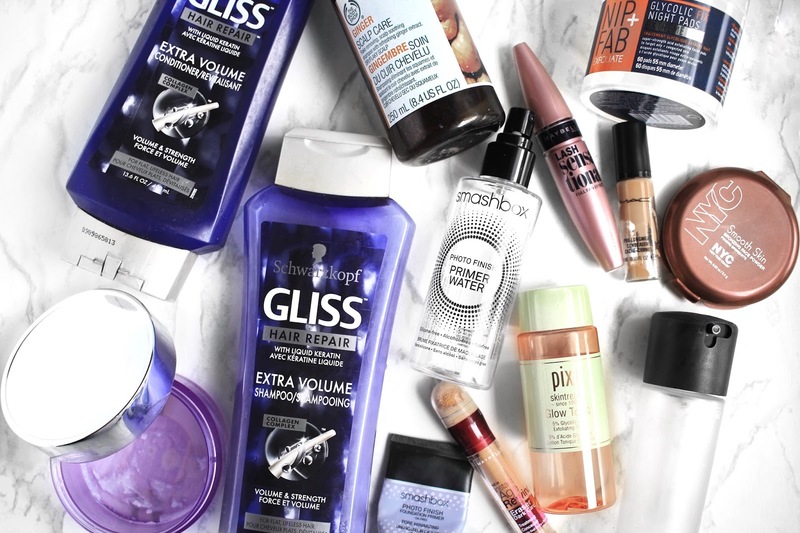 It's time for another product empties haul! I feel like these bits have been sitting in a box for the longest time and I'm so glad to finally be getting rid of them all. In fact, as soon as I took the photo above, I tossed them right in the trash. I'm pretty proud of myself for getting through so many bits this time around as a bunch of them were pretty big! Let's get into it..'cause it's gonna be a long one. Smashbox Photo Finish Pore Minimizing Primer | This one was the mini size, so I have no idea why it took me so long to finish it. However, I really like it. It's pretty darn similar to the Benefit Porefessional which is one of my favourite primers. One thing I didn't like so much about this one though was the packaging. Nearing the end, it was extremely hard to get product out. Would I repurchase? Maybe. Maybelline Age Rewind Concealer | Is it really an empties post without this concealer? I can't even tell you how many times I've repurchased this or how much I love this thing. I've mentioned it multiple times on my blog. So I guess you could say I swear by it. Would I repurchase? A million times, yes. MAC Pro Longwear Concealer | Holy cow, I've had this for super long. Long enough to the point that it stopped performing the way it should have. Before it reached the end of it's shelf life, I can say that I appreciated it. It had phenomenal coverage, a little went a very long way. It was easy to blend, it didn't sink into my fine lines. Would I repurchase? If I feel like I need a boost in coverage in the future, then yes. NYC Sunny Bronzer | There was a time when I didn't use bronzers, but the moment I did, the game was changed forever. And what's better than an good affordable bronzer? The Sunny Bronzer is exactly that. It's a matte bronzer that's pigmented but it doesn't go on streaky or blotchy. Would I repurchase? Already have. Maybelline Lash Sensational Mascara | A cult favourite. And for a reason. Definitely one of the best, if not the absolute best, mascaras I've tried. If you've been around long enough, then you know my lashes don't cooperate with a lot of mascaras, but this one wow'd me because not only does it volumize my lashes, but it also lengthens and separates them well. Would I repurchase? Already have! MAC Fix+ Spray | Just like the Maybelline concealer; would it be an empties post without one of these? I run through these things so fast, wow. They need to make these things cheaper because I repurchase them 3 or 4 times a year. And for some 'water', they're not too cheap! I use this every time I wear makeup to 'melt' away the powder to make it look more natural/skin-like. I feel like it's one of those products I can't live without. Would I repurchase? Would purchase back-ups of back-ups if I had the funds. Smashbox Primer Water Spray | Honestly, this product is just like the Fix+. When this thing first came out, I watched a video of someone comparing the ingredients of this to the Fix+ and they were basically the same thing. However, one this I liked better about this over the MAC one is that the spritz was finer and more even. Otherwise, they both gave the same effect. Would I repurchase? Maybe. Nip+Fab Glycolic Fix Night Pads | After trying the regular version of these, a lot of people recommended me to try these Night Pads. I didn't need to, but of course I had to! #doitfortheblog. I didn't notice much of a difference between the two. Both did great things for my skin, which I'm happy about! I liked the smell of the original version better though. The convenience of these pads is lifesaving; especially for people who get super lazy for their nighttime routine (like me). Would I repurchase? Yup! Pixi Glow Tonic | When a product is hyped in the blogosphere, I am so compelled to jump on the bandwagon. 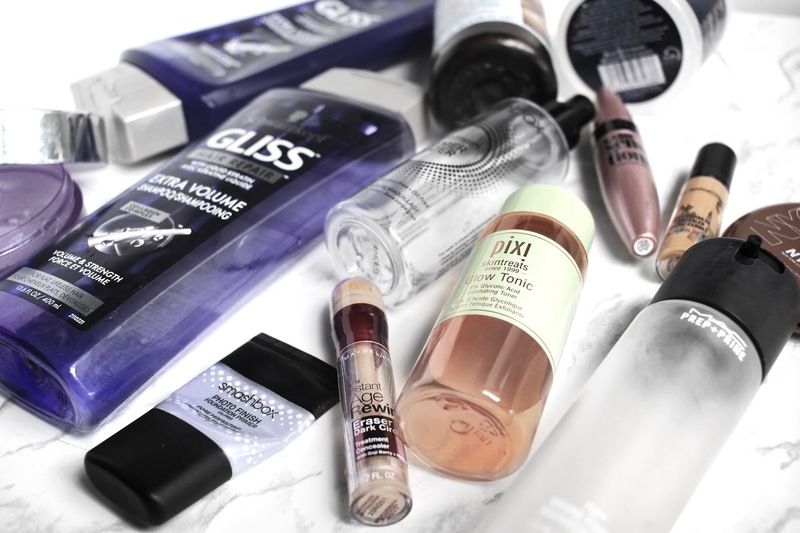 As soon as Pixi hit Canadian drugstores, I jumped on it. I have to say that I really did enjoy this thing. At first, I was a bit put off by the smell, but it isn't something irritating so I eventually got used to it. The results my skin saw afterwards kept me around even longer. But whyyyyy does it have to be so expensive *cry. Would I repurchase? Despite it's price, I'd have to say yes. Clinique Take The Day Off Cleansing Balm | I finished this a few months ago, but was saving it for this post. I remember buying it around this time, last year. So yes, it did last me quite a while. This is the best cleansing balm ever. Girrrrrl, you need this in your life. Would I repurchase? Yes!!!!! Dove Shower Foam in Cucumber & Green Tea | I was persuaded by Shireen from Reflection of Sanity to buy this and it's become a family favourite. Seriously, everybody in my household likes it. I even got my boyfriend to buy one for this place. It smells really light and I feel squeaky clean when I use this. Would I repurchase? I have already! Gliss Hair Repair Extra Volume Shampoo* | I've reviewed this shampoo and the matching conditioner not too long ago in this post. All I need to say about both is that they did great things for my hair & I'm surprised a drugstore hair product could give me decent volume. Would I repurchase? Yep! Gliss Hair Repair Extra Volume Conditioner* | Same thing that I mentioned above. Oh, did I mention that my mom's a huge fan of these two bits now as well? Check out my review post for more deets on this guy. Would I repurchase? Yas. The Body Shop Ginger Scalp Care | This was originally my boyfriend's purchase. He bought it to help with his flakes that were forming before his scalp was dry. It didn't work for him, but when I went to his place and tried it, I decided to take it home with me. I don't completely love this. But I can say that my scalp felt really clean and fresh whenever I used this. The scent was okay - not something I'd normally reach for though. Would I repurchase? Maybe. Maybe not. Phew, that was a long one. What have you finished up lately?